©Brigadier-General Paul A. Pakenham (Retd) – September 2018. 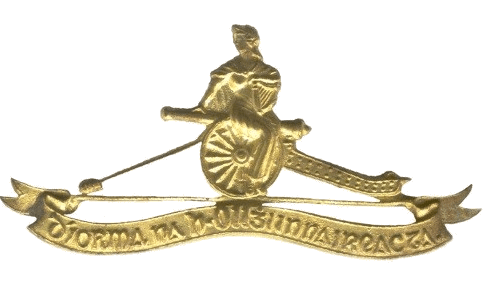 2018 is the 95th Anniversary of the establishment of the Irish Defence Forces Artillery Corps on 23 March, 1923. The year marks 60 years of continuous service by Óglaigh na hÉireann in peacekeeping duties with the United Nations. 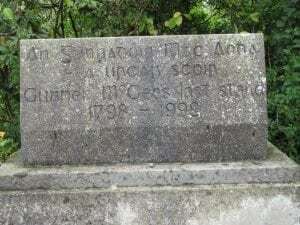 2018 is also the 220th Anniversary of Gunner James Magee’s heroic action at the Battle of Ballinamuck, County Longford, the final military engagement of the 1798 Rebellion. 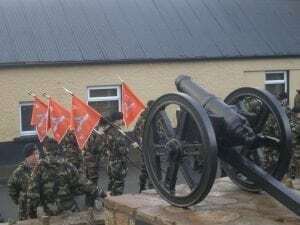 In addition to paying homage to Saint Barbara, patron saint of gunners worldwide, the Artillery Corps is unique within the Defence Forces, in that it has an historical figurehead, namely Gunner Magee, from who derives some of the Corps rich heritage and enduring values of respect, loyalty, selflessness, physical courage, moral courage and integrity. 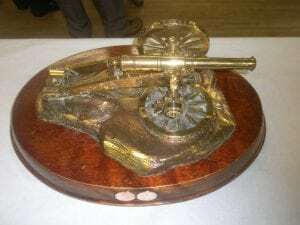 Since the establishment of the Artillery Corps on 23 May, 1923, Gunner Magee’s courage, heroism, and resourcefulness have inspired gunners of all ranks, and his heroic stand during the Battle of Ballinamuck has been commemorated and honoured by the Corps. Setting the scene for the paper, a timeline is outlined, the accessible fire support available in Ireland during the 18th century is discussed, and aspects of the Royal Longford Militia are presented. From an artillery perspective, an insight into General Jean Humbert’s Franco-Irish campaign from his landing in Mayo on 22 August, to the Battle of Ballinamuck on 08 September, 1798, is summerised. Focusing on Gunner Magee, the paper then discusses his heroic action in Ballinamuck, advances social memory sources including the National Folklore Collection. The paper also provides information regarding the association of Gunner Magee with Magee Barracks, the Magee Gun Trophy, the Battle of Ballinamuck Painting, the Magee March and the Ballad of Gunner Magee. For completion purposes, the Battle of New Orleans, which involved two of the participants in the Battle of Ballinamuck, and the Ballinamuck Visitor Centre are also included. Any discrepancies in the paper, or additional information on Gunner Magee, will be gratefully received by the Artillery Club, and reflected, as appropriate, in future iterations. An abstract of the paper is contained in Annex A. The content of this annex provides a basis on which presentations, articles, commentaries, and further studies, associated with Gunner Magee and the Battle of Ballinamuck, can be advanced. Information on issues relating to Gunner Magee is also provided: Magee Barracks Kildare, the Magee Gun Trophy, the Battle of Ballinamuck Painting, the Magee March and the Ballad of Gunner Magee.. There is ample scope for additional research in order to augment the content of this paper. For example, during the elaboration process, it was not possible to establish Gunner Magee’s date and place of birth. The discovery of the Personnel Lists / Muster Lists for 1798 would facilitate the determination that Gunner Magee served with the Royal Longford Militia. Likewise, as Irish Militias did not have the rank of gunner, this raises a possibility that Gunner Magee, (and indeed Gunner Casey), may have received artillery training with the Royal Irish Artillery Regiment. The support of various institutions in the development of this paper is appreciated, including: Defence Forces Military Archives, Defence Forces School of Music, South Dublin County Libraries, County Westmeath Library Mullingar, and the Ballinamuck Visitor Centre.